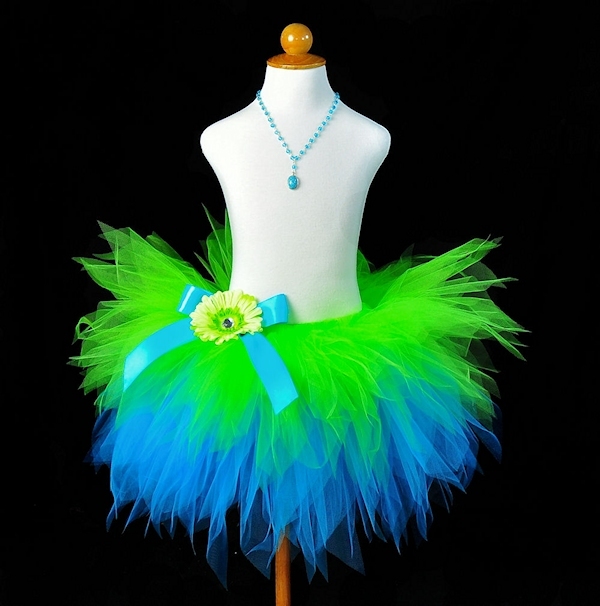 Turquoise and lime green layered pixie tutu for toddlers, girls and women. The Daphne pixie cut layered tutu features a shorter top layer of lime tulle and a long turquoise bottom layer. Both layers are pixie cut for a wispy, fairy-like appearance. This tutu is absolutely stunning in person and is perfect for a Halloween costume, birthday tutu, photo prop, gift or everyday play. Tutu includes a satin bow at the waist and optional flower clip. *You are welcome to choose two different colors. Please include the top and bottom layer colors in your order notes.